The plan includes cooperation on clean energy technologies, capacity building, and “very important efforts on helping China build a robust, transparent and accurate inventory of the greenhouse gas emissions. One could almost hear the collective, global sigh of relief as such words were uttered. Jin Jiamin, executive director of the Global Environmental Institute in Beijing, reflected both satisfaction and surprise at the stated commitment for action and cooperation between the two countries. After a relentless battering of expectations and hopes for a substantive breakthrough in Copenhagen – from dysfunctional Senate proceedings on climate legislation to disappointment at the lack of progress on pre-COP15 talks in Barcelona – the mood has lightened considerably. In the beginning, we really didn’t have a hope that a treaty would be reached,” Jin said. “I was surprised to find out in the joint statement that the two countries both expressed an interest and willingness to work within the UNFCCC Framework as well as the Bali Road Map. But as I wrote yesterday on TriplePundit, success in Copenhagen is an exercise in expectation management. Perhaps are expectation should be a bit higher than we’ve been told lately. U.S.-China Clean Energy Research Center. The two Presidents announced the establishment of the U.S.-China Clean Energy Research Center. The Center will facilitate joint research and development of clean energy technologies by teams of scientists and engineers from the United States and China, as well as serve as a clearinghouse to help researchers in each country. The Center will be supported by public and private funding of at least $150 million over five years, split evenly between the two countries. Initial research priorities will be building energy efficiency, clean coal including carbon capture and storage, and clean vehicles. The Protocol formally establishing the Center was signed in Beijing by U.S. Energy Secretary Steven Chu, Chinese Minister of Science and Technology Wan Gang, and Chinese National Energy Agency Acting Administrator Zhang Guobao. U.S.-China Electric Vehicles Initiative. The two Presidents announced the launch of the U.S.-China Electric Vehicles Initiative. Building on the first-ever US-China Electric Vehicle Forum in September 2009, the initiative will include joint standards development, demonstration projects in more than a dozen cities, technical roadmapping and public education projects. The two leaders emphasized their countries’ strong shared interest in accelerating the deployment of electric vehicles in order to reduce oil dependence, cut greenhouse gas emissions and promote economic growth. U.S.-China Energy Efficiency Action Plan. The two Presidents announced the launch of a new U.S.-China Energy Efficiency Action Plan. Under the new plan, the two countries will work together to improve the energy efficiency of buildings, industrial facilities, and consumer appliances. U.S. and Chinese officials will work together and with the private sector to develop energy efficient building codes and rating systems, benchmark industrial energy efficiency, train building inspectors and energy efficiency auditors for industrial facilities, harmonize test procedures and performance metrics for energy efficient consumer products, exchange best practices in energy efficient labeling systems, and convene a new U.S.-China Energy Efficiency Forum to be held annually, rotating between the two countries. U.S.-China Renewable Energy Partnership. The two Presidents announced the launch of a new U.S.-China Renewable Energy Partnership. Under the Partnership, the two countries will develop roadmaps for wide-spread renewable energy deployment in both countries. The Partnership will also provide technical and analytical resources to states and regions in both countries to support renewable energy deployment and will facilitate state-to-state and region-to-region partnerships to share experience and best practices. A new Advanced Grid Working Group will bring together U.S. and Chinese policymakers, regulators, industry leaders, and civil society to develop strategies for grid modernization in both countries. A new U.S.-China Renewable Energy Forum will be held annually, rotating between the two countries. 21st Century Coal. The two Presidents pledged to promote cooperation on cleaner uses of coal, including large-scale carbon capture and storage (CCS) demonstration projects. Through the new U.S.-China Clean Energy Research Center, the two countries are launching a program of technical cooperation to bring teams of U.S. and Chinese scientists and engineers together in developing clean coal and CCS technologies. The two governments are also actively engaging industry, academia, and civil society in advancing clean coal and CCS solutions. The Presidents welcomed: (i) a grant from the U.S. Trade and Development Agency to the China Power Engineering and Consulting Group Corporation to support a feasibility study for an integrated gasification combined cycle (IGCC) power plant in China using American technology, (ii) an agreement by Missouri-based Peabody Energy to participate in GreenGen, a project of several major Chinese energy companies to develop a near-zero emissions coal-fired power plant, (iii) an agreement between GE and Shenhua Corporation to collaborate on the development and deployment of IGCC and other clean coal technologies; and (iv) an agreement between AES and Songzao Coal and Electric Company to use methane captured from a coal mine in Chongqing, China, to generate electricity and reduce greenhouse gas emissions. Shale Gas Initiative. 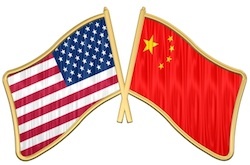 The two Presidents announced the launch of a new U.S.-China Shale Gas Resource Initiative. Under the Initiative, the U.S. and China will use experience gained in the United States to assess China’s shale gas potential, promote environmentally-sustainable development of shale gas resources, conduct joint technical studies to accelerate development of shale gas resources in China, and promote shale gas investment in China through the U.S.-China Oil and Gas Industry Forum, study tours, and workshops. U.S.-China Energy Cooperation Program. The two Presidents announced the establishment of the U.S.-China Energy Cooperation Program. The program will leverage private sector resources for project development work in China across a broad array of clean energy projects, to the benefit of both nations. More than 22 companies are founding members of the program. The ECP will include collaborative projects on renewable energy, smart grid, clean transportation, green building, clean coal, combined heat and power, and energy efficiency.